It’s been 240 years since the Revolutionary War ended, and our spouses still need our support on the home front. If you close your eyes, I bet you can picture the scene in Yorktown in 1776. The sweeping grass and rolling hills of Virginia. The men in their uniforms: the tall boots, fitted pants, the tails of a cropped jacket whose hand-adorned golden buttons mimic soldiers in a straight line. The wigs, the pirate-like hats, the bayonets in hand. Now, add the low rumble of a snare drum, the distant sound of a cannon. Just slightly different than the battlefields of today, right? No wigs, smaller hats, more practical uniforms, not to mention the vastly evolved warfare. And, yet, some things don’t change: valor, commitment, and the importance of good communication with your spouse. 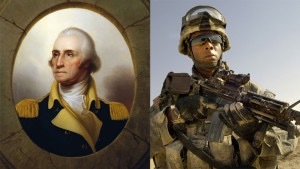 In honor of the 4th of July, SpouseBuzz presents an actual excerpt from a letter from George Washington to his wife Martha (apparent typos included on purpose) … followed by what it would sound like in an updated version for today’s military couple.